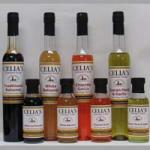 Our 4 piece gift packs are perfect for those that would like to mix and match different flavors. They make excellent gifts and make a perfect addition to anyone's culinary experience! Mix and match any of the listed flavors and get the most out of our fantastic products!